What used to be more of a concern when reporting from active warzones is now becoming a reality of reporting in an alarming number of places. 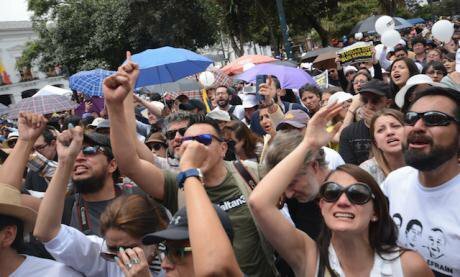 Hundreds protest after the president of Ecuador, Lenin Moreno, confirmed the murder of three kidnapped journalists from the newspaper El Comercio, in Quito, Ecuador on April 13, 2018. NurPhoto/ Press Association. All rights reserved.In the spring issue of the Index on Censorship magazine, we interviewed Aasim Saaed, who was kidnapped and held in captivity for 21 days last year. He said his kidnapping departed from the past because it was carried out by state forces, rather than the more commonplace accomplices – extremists. “People are definitely scared. Another guy was picked up recently,” he added. Saaed joins a cohort of abducted journalists and dissidents in the country. According to the Human Rights Commission of Pakistan, since 2011 more than 3,500 such disappearances have occurred. “There are usually procedures to be followed when summoning journalists… We are now being intimidated,” said journalist Charles Etukuri, who was also recently kidnapped, in his case in Uganda. Working for the publication New Vision, he thinks his abduction was because of an article he wrote in February detailing the death of a Finnish national in the Ugandan capital Kampala. On route to lunch, Etukuri was surrounded by men in military uniform, handcuffed, taken to an undisclosed location and held for six days. While in custody, his captors demanded that he reveal the sources behind the story, but he refused. They only let him go once they had gone through all of his private emails. Etukuri believes the problem lies with a few government officials in the security department. “It’s saddening that the president who fought for establishing the rule of law is silent,” he added. Etukuri is the second high-profile journalist to have been kidnapped in Uganda recently. Freelance journalist Isaac Bakka disappeared in October 2017 and it was only this February that news of his imprisonment emerged. He has allegedly been charged with high treason. Kidnappings are not just occurring in Pakistan and Uganda. Across the world we’re seeing journalists and writers who dare to criticise people in power disappear. Targeting families is part of this tactic, as Chinese-American journalist Chen Xiaoping learnt when his wife was kidnapped within China last September. In January, a video of her emerged. In it she said that she cut off all contact with Chen due to “emotional issues” and his “overseas work”. It’s a tactic the staff at Radio Free Asia know all too well, where four staff members who report from Washington on China’s presence in Xinjiang have seen their close relatives detained. For Shohret Hoshur three of his brothers have been arrested. One still remains in prison. Both Etukuri and Saaed fear for their families too. “Before I was freed, my family received messages threatening their lives. Since I’ve left my parents are still visited,” said Saeed. Etukuri said his kidnappers attacked his home and harassed his family. Some of those who are kidnapped are released, others are not. The body of disappeared Honduran journalist Ángel Alfredo Villatoro Rivera was found last May. Villatoro’s murder occurred a week after another kidnapped Honduran journalist, Erik Martinez Ávila, was found dead. “Dozens of journalists have been forcibly disappeared across Latin America in recent years, with Mexico becoming the most dangerous country in the region to practice this profession. This is a terrifying trend, with many cases ending in killings and/or complete impunity,” Duncan Tucker, regional media manager for Amnesty International in the Americas, told Index. “Those brave enough to uncover corruption and collusion between the authorities and organised crime are most at risk. In fact, the authorities who should be protecting journalists and defending their right to freedom of expression are often implicated in threats and attacks against them,” he continued. The trend also transcends borders. Many regimes now have the ability to spy – and seize people – anywhere in the world. Afghan Mukhtarli, a journalist living in Tbilisi, Georgia was kidnapped last year there and resurfaced in his home country, Azerbaijan. Mukhtarli was investigating the assets of the first family of Azerbaijan in Georgia, according to a Facebook post by a colleague of his. A year earlier, pro-democracy journalist Li Xin was taken in Thailand and sent back to China. The list goes on and on. These kidnappings are highly effective, both at silencing the individuals directly affected and at sending chills through the broader media community. Speaking to Yemeni journalist, cameraman and filmmaker Abdulaziz Muhammad al-Sabri, he explained that he continues to be affected “psychologically and negatively to this day” and has “had difficulties recovering from it”. Al-Sabri was kidnapped twice, in one instance being held in chains for 15 days. His laptop and camera were also destroyed. He says he can’t go back to work. A Chinese journalist, who wished to remain anonymous, said he had recently left the industry and did not expect to return anytime soon. His move away from media is sad, but understandable. If these dangers are not addressed, and incidences continue to rise, we’re likely to see more journalists removing themselves from the industry before they’re removed from the streets. We’re all be the worse for this.